Fact: If your blog content isn’t easy on the eyes, you’re going to lose readers. It’s a harsh reality, but even if the writing is great, web browsers aren’t going to stay on your site if it’s just a wall of text. You need interesting visuals to capture customers’ attention, get them to digest your message and consider how your business can help them. Once our clients start to hit goals for organic search traffic numbers, they ask what else we can do to improve engagement and really get their visitors to move deeper into the sales funnel. We advise them to up the ante with the overall look of their blog content. 1. You’re referencing data: Include charts and graphs to give a visual representation of the report or study you’re covering. Remember the golden writing rule: Show don’t tell? This is where it’s applicable. 2. You’re highlighting a great line: If there’s a solid quote, data point or line of copy, show it off. Calling out high-impact information can be the motivation to continue reading. It was a no-brainer for the travel company: People want to see images of the destinations they were reading about to get a better idea of what to expect if they purchase a trip. The content writers added inline images of the locations or attractions highlighted in each post. 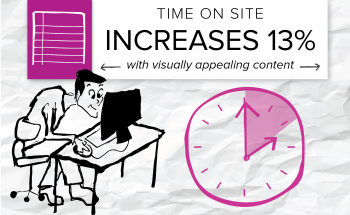 We’ve seen that visuals increase willingness to read up to 80 percent. A related picture gives visitors a clear image to connect with, but it also provides a pause in the narrative to re-engage readers. In addition to the images, the writers inserted pull-quotes where relevant to highlight interesting facts about the destinations and subjects they were covering. This ensures the most fascinating tidbits of information that will capture readers’ attention are at the forefront of the content, rather than buried in a paragraph of text. Why is engagement so important to a content marketing strategy’s success? It means people are coming to your site and finding value. It suggests they’re interested in learning more about your business and acting on that instinct. In the case of our travel client, stronger engagement metrics came hand-in-hand with organic traffic growth and a higher conversion rate. Sessions increased 23 percent and conversions jumped 13 percent for the month. This isn’t the only company to see success from a blog makeover. Businesses across industries have similarly experienced an uptick in engagement metrics and visits when they take a critical eye to the appearance of their websites and make the content they’re investing in look sharp. It’s a basic strategy: Look your best and people will notice.